A perfect opening day. Set up was calm and slow as patrons (human and otherwise) dribbled in toward the Zombie Info and Ottawa Horror booth. Both founders of Ottawa Horror are now in attendance, so feel free to harass them, pick up a t-shirt or any of the books and films available, and talk independent or mainstream horror! Dozens of Ottawa folk have dropped by the booth. Can't express how stoked we are to see FOF Fans from home! Right away, fans of living dead were getting "Info" straight from the source. With so many flavours of zombie, so many takes on the genre, and so many fan impressions, it is entertaining listening to the comments and discussion happening here. Of course, after set up and prior to hang-outs with two of my favorite book types (Colum McKnight and Jason Darrick), I spent time at the Post Mortem Press booth. They have two Canadian authors represented so check them out to stock up on home brew horror. If you just want genre fiction and some really fresh small press, check them out. They are right beside Books of the Dead Press - and both specialize in zombies that actually rot and vampires that refuse to sparkle. We also had a surprise visit from the author of Long Live the New Flesh, one of the go-to Fangoria blogs. His recent post covers one of the video stores I also frequented in the latter part of my formative years as a horror fan, Bandito Video. And by surprise visit, I do mean surprise. I had not seen Dave in well over a decade! 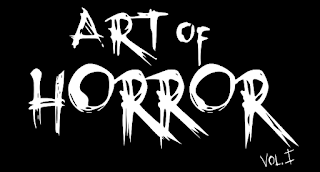 For the duration of FanExpo, we will be featuring some outstanding Ottawa horror artists. As you may well know, Brian Singleton (Werewolf Fever) will be stopping by Zombie Info on Saturday. Today, OH began the Ottawa feature with the art of Brian Typhair, and we will be displaying his work every day. Tomorrow, we will have more information on Patron Saint of Plagues, as well as copies of their recent release and the rest of the PSOP stickers that did not get snapped up today. Gotta love freebies!